"I ain't got no home, I'm just a-roamin' round," Woody Guthrie lamented in one of his most popular songs. A native of Oklahoma, he was still in his teens when he moved to Pampa, Texas, where he experienced the dust storms that would play such a crucial role in forming his identity and shaping his work. He later joined thousands of Americans who headed to California to escape the devastation of the Dust Bowl. 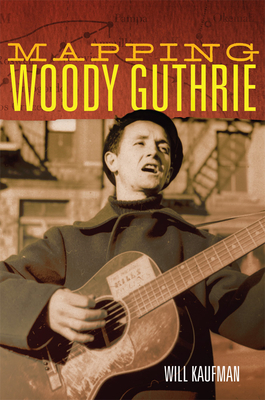 There he entered the West Coast stronghold of the Popular Front, whose leftward influence on his thinking would continue after his move in 1940 to New York, where the American folk music renaissance began when Guthrie encountered Pete Seeger and Lead Belly. Guthrie kept moving throughout his life, making friends, soaking up influences, and writing about his experiences. Along the way, he produced more than 3,000 songs, as well as fiction, journalism, poetry, and visual art, that gave voice to the distressed and dispossessed. In this insightful book, Will Kaufman examines the artist's career through a unique perspective: the role of time and place in Guthrie's artistic evolution. Guthrie disdained boundaries--whether of geography, class, race, or religion. As he once claimed in his inimitable style, "There ain't no such thing as east west north or south." Nevertheless, places were critical to Guthrie's life, thought, and creativity. He referred to himself as a "compass-pointer man," and after his sojourn in California, he headed up to the Pacific Northwest, on to New York, and crossed the Atlantic as a merchant marine. Before his death from Huntington's disease in 1967, Guthrie had one more important trip to take: to the Florida swamplands of Beluthahatchee, in the heart of the South. There he produced some of his most trenchant criticisms of Jim Crow racism--a portion of his work that scholars have tended to overlook. To map Guthrie's movements across space and time, the author draws not only on the artist's considerable recorded and published output but on a wealth of unpublished sources--including letters, essays, song lyrics, and notebooks--housed in the Woody Guthrie Archives in Tulsa, Oklahoma. This trove of primary documents deepens Kaufman's intriguing portrait of a unique American artist.